Hi hello I'm really thirsty for some new designs soooo show me what you've got up for grabs? Preferably masculine and/or muscular in physique! Closed Species; not interested in any! Comments or PMs are welcome! Thanks for looking! Well, its time for a major purge, in part to pay for college tuition, and also because I've just been hoarding a lot of designs I've done nothing with and I need to be a little more responsible with what I buy 8') I'll be much less tentative with these, but for reasons mentioned, money will be a priority! I will not do any payment plans or extended holds. NOT interested in ferals/quads or any CS. ....check out my faves for an idea of what I like! Feel free to comment or PM me offers! Thanks for looking! While Stelengel have been a recent invention of mine, some may not know that I actually have created a handful of CS in the past. Granted, the majority are quite old (damn, time flies...) so I just wanted to make some definitive decisions on these for anyone who is interested. Input is greatly appreciated, as well! If you have interest in one of the species described below, please comment or let me know! My most recent and most active CS! These are the species I am primarily working on now. Also seeking authorized designers. I have been considering revamping and re-releasing the Weather Nymphs, potentially as a 'fantasy' counterpart to the Stelengel. Of course, plant-oriented CS are hardly unique anymore...but I'm still fond of their lore and overall aesthetics! If you're interested in them, please let me know! Also seeking authorized designers. While this species is not discontinued, I'm not actively creating new designs at this time. I may be open to customs or trades. Also seeking authorized designers. While this species is not discontinued, I'm not actively creating new designs at this time. I may be open to customs or trades. Unfortunately, my interest in this species and its aesthetic is gone, so this species is officially discontinued. If you own a Jie, you are welcome to maintain their lore, revamp them, or do whatever you'd like with them. No future Jie will be created. I don't know why I thought a winged species was a good idea considering I loathe drawing wings. Also, the concept of this species, while something I still enjoy aspects of, feels antiquated and not all that unique to me anymore. Unfortunately, that means no future Súilo will be created. If you own one (I don't think I ever distributed many) you're welcome to maintain their lore, revamp them, or do whatever you'd like with them. And that's it! If you have any questions, feel free to ask! If you are interested in purchasing the rights to one of the species I've discontinued, or are interested in designer rights for any of them, feel free to send me a note (for purchasing rights, there will be certain conditions). Cheers! Holiday Wishlists! Show me yours! So link me to your holiday wishlists! (Or regular wishlists are fine). No guarantees, of course, but I'll take a look at links over the next few months and see what I can do here or there. It can be things like art of OCs, custom designs, things you'd like bought for you, etc. The only requirement is that it has to be something that I can do as a surprise! (aka, I don't have to contact you for info). So amazon wishlists should have addresses for things to be sent to, art requests should include OC refs, etc. You know the drill. You can add your link whenever...no deadline for this until after the holidays, so like...January 1st. Any time before then, feel free to toss your journal links below! And just for the sake of equity, here is my wishlist. That said, I'm not expecting anything and in no way is there any requirement to reciprocate if I do something for you! I'm very picky, so I'd ask that you not randomly buy/trade to get me a design unless you know for a fact its one I want...I wouldn't want you wasting the money on something I may not use! But if its something in my favorites, here or on deviantart, its a pretty safe bet (especially faves on toyhou.se). Once again, I'm very picky, and I wouldn't want you wasting the time and effort on something I may not end up using...so unless I watch you and/or have bought designs from you, this probably isn't a safe bet...but you can see my faves once again for an idea on my aesthetic...Generally speaking, my top tier interests are: Muscular/masculine males, horns, simple markings, tattoos, piercings, aliens, faceless (no eyes/nose but with a mouth), beards. New CS: Stelengel Batch 1 21/4 OPEN! There will be several bases for the initial few batches, but to start I went with this one! I hope you like them! See the bottom of this post for species information! :> For this first batch I did all UC or Rare traits as part of the initial celebration! The third design shows a rare body trait (wings)--the body trait ref sheet should be done very soon! This one is a Draw to Adopt/Write to Adopt because the file is slightly smaller! To get this design, you must draw and/or write about your interpretation of the design. You can change the gender and build however you desire. Any art or writing you create will be fanart for the winner of the design. Please do not be a sore loser if you aren't chosen, or remove your submission if you lose. Drawings must be at least a colored halfbody sketch, and writing must be at least 400 words. Comment with your submissions for the D(W)TA below. Deadline is 11/24/18 and a winner will be chosen the same day. 1. Adopts are first come first serve (not including Prototype). Do not claim unless you have the funds available! Payment can be made via paypal, venmo, or cash app. 2. You may alter the gender or build of your design however you'd like, but do not tweak the overall design without confirming with me that it's okay. You may not alter the design to include traits of greater rarity. 3. You do not need to abide by the official lore of Stelengel. Make them a fish-turned-humanoid if you want. 4. You may resell, trade, or gift your design. Do not resell for higher than you paid unless there is additional artwork with the design. If you receive the design at a later date as a trade or gift, you may not resell it or take vouchers for it. Find the info on Deviantart! 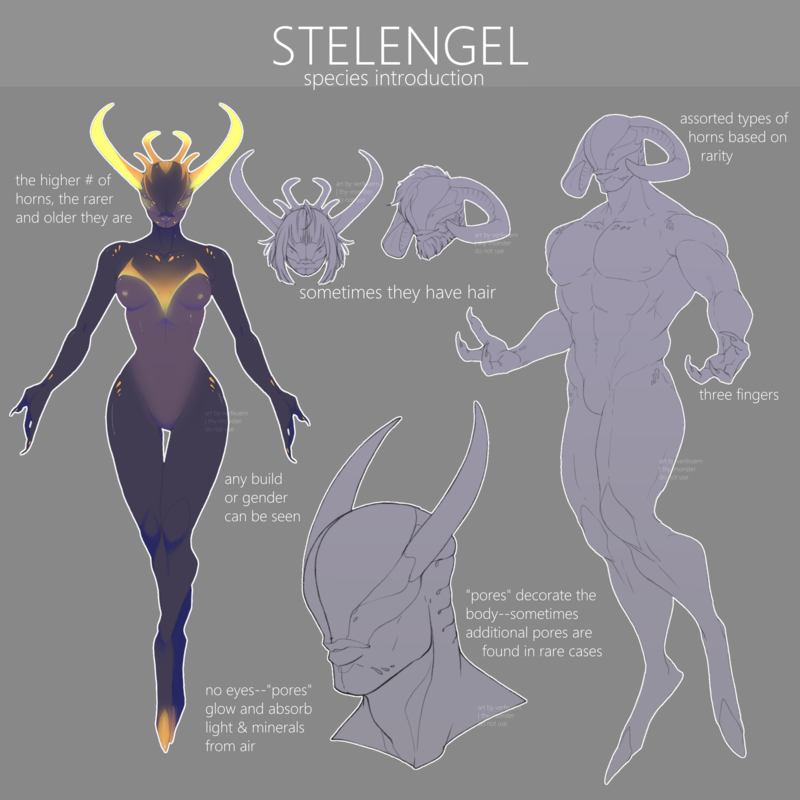 Introducing a new closed species I've been thinking about, Stelengel! Background is still a WIP! But I will be working up a trait sheet in the near future and hopefully starting to make some adopts...Not sure why I never made an alien CS before, but figured it was about time I create something pulled directly from my aesthetic 8')c (and frankly what I'm best at drawing). Was going to color this whole thing but got tired. Will prob use these as bases for future adopts, though! In the meantime, I would love to hear of peoples' interests or even of traits you might like to see on these beans!! Do you have the Mac Snow Leopard OS on disc? I need the OS installation disc for the old Snow Leopard (10.6) for Mac....does anyone happen to have one sitting around that they'd be willing to mail to me? I can pay for shipping AND would be happy to draw for someone in exchange <3 Trying to upgrade an ooold 2007 iMac to a functional state, but its so old that I can't even upgrade the OS to the current operating system without upgrading it to a newer old one lmao. Designs for sale (not mine)- financial emergency! Just signal boosting for ChiefHunter! These are all my currently single (and some are undeveloped) kids. Anyone wanna chat and headcanon about potential (not guaranteed!) couples? 18+ only please, cause I'm old and it's weird otherwise. Here's my RP/HC comfort meme as well! I'm just posting this to refer people to in the future! Keep in mind I don't really RP anymore...rarely, I may be open to a scene or two, but generally that's just not something I have the time or energy for these days. This more references headcanoning/worldbuilding, and character chatter/shipping at this point! If I RP, its going to be between 1-5 paragraphs, most likely. But for headcanoning and etc, it's just a matter of what we're talking about. - Anyone and everyone at any time! - When I ask for role-plays. - From friends and acquaintances. I'm usually fine with random requests or friends and acquaintances, so long as you know I don't really RP much anymore and it'd mostly/only be headcanoning and the like! - Our character know each other deeply. - Our character know each other deeply, and I know I can trust the role-player. - At the first sign of flirting! - Only if the role-player and I plan it. - It depends on the character. - Talk to me about it from the start. - Talk to me about it once our characters know each other. - Talk to me about it once they both have some feelings for each other. - Talk to me about it when they finally decide that want to go beyond hugging. I think this really depends, but generally talking about it is always important before anything becomes official. I always tell people that I'm happy to try things out with a pair, but its no guarantee they'll end up together. I approach ships organically, so even if we aren't RPing them, we should discuss more about them together and see if they'd be a good fit. - Fast, but not super fast. - Happens in about three months. - Slow and steady wins the race. - Slugs know what's up! - My relationships know no speed. They happen if they happen. Again, this entirely depends on the character. - To write the act only if it is very special, but otherwise skip it. - To write the act all the way through. Probably won't apply since I don't really RP much, but just in case...it depends on my mood. Some days I'm cool writing it out, sometimes I'm not feeling it. - Do not post it at all without talking to me. - Post it if it is cuddles and hugs. - Post it if it is kisses. - Post it if it is much more. - Do not post it at all if it depicts sexual acts! - Do not post it where I can see it, but draw what you like! I would assume I'd know about it either way since...I'd ideally be the first person to see it?? But yeah you're welcome to draw this IF they're officially together and/or I've given permission for casual/non-canon stuff. - No violence at all! - I'm fine with verbal arguments! - Some violence, like a paper cut, or an accidental elbow to the face. - Mild violence, such as punching, kicking, hair pulling. - Violence, such as stabbings. - Beyond violence, such as torture and more. - Don't do it at all. - Talk to me about it first. - Do not post any dramatic scenes that that happened between our characters. - Talk to me about it before posting! - Post what you like! I don't subscribe to the idea that the more angst the better! It should make sense, and I don't want my characters drawn in a way that I may feel is out of character or offensive...so yeah, just talk to me first!